We can all agree that keeping food fresh is important. Not only to avoid waste but to preserve taste as well. When I was asked to provide a review for Turn-n-Seal Containers I was happy to do so. My pantry has very few products still in their original packaging. I put everything into clear airtight containers. I like being able to lock in freshness and to see how much is inside, so I know when to add it to the market list. Three containers and one lid arrived packaged well. I read the pamphlet (instruction manual) before I started. It has plenty of diagrams which is nice, but the instructions are a bit confusing, and it needs to be edited a bit better for English, this is also true of their website. It is important to note that the manual hits the basics and mentions marinating meat in the container to infuse flavor. So, these containers are not just for food storage. They can be used in refrigerator and freezer too. But, you cannot put them in the microwave or dishwasher which is fine. The containers are stackable and come in a variety of sizes. Unfortunately, I washed my lid and container before visiting their website. This caused a lot of frustration on my part. As the lid had to dry out for days and then when it appeared to be dry I placed almonds into the container and followed the instructions to seal it and water squirted inside the container and on the food inside as well. It was a disappointment. I went back to the owner’s manual and saw the link provided and went to YouTube for instructions on a variety of ways to clean the lid. I think the concept for the Turn-n-Seal container is a good one, but I think cleaning instructions need to be included in the instruction manual. Having to go online to learn how to clean it properly will cause consumer frustration. I still gave the Turn-n-Seal container two stars for concept, packaging, and presentation. Keep your Moscow mule cocktail or mocktail cold until the last drop. These pretty handmade copper Moscow Mule mugs will keep your ice from melting as quickly as it would in a different cup or glass. Which is something we can all agree is important when enjoying any cold beverage. These handmade Moscow Mule Mugs created by Moscow Muled are lightweight, have a 100% customer satisfaction guarantee and at nearly 4 inches in height, 5 inches in width and 3 inches wide at the rim, they are the perfect size for a cold Moscow Mule cocktail or mocktail. Try adding cucumber or strawberries to your favorite Moscow Mule recipe. The mugs arrived in a plain brown box, well packed with bubble wrap and brown paper and included a card with cleaning instructions and a Moscow Mule recipe. These mugs must be cleaned by hand and may need an occasional polishing when patina naturally occurs. It is important to note that these copper mugs are intended for enjoying a Moscow Mule beverage. But, they can also be used for other cold beverages as well. I personally do not recommend using these mugs for hot beverages though. Lemonade and Ice Tea taste fantastic when enjoyed from one of these mugs too. As many of you know, I am an artist and designer and I always love working with other artisans. I was very excited to open this package. The butcher block arrived wrapped well and sealed in plastic. The conditioner and mineral oil (food safe) was sealed well and in a separate bag. I was surprised by the sheer” heft” of this butcher block. I thought it might be difficult to lift. But, there are slots for your hands on both ends. I believe a quality butcher block or cutting board is an essential tool for all cooks, beginners and experienced. The fact that this beautiful wood grained block was made by hand makes it even more special. The craftsmanship of this kitchen essential needs no mention, as it speaks for itself. I’ve circled the wood grain so you can see what I mean. I followed the directions to get my block ready for use. A couple of coats of the conditioner and mineral oil and the butcher block was ready to become a functional tool in my kitchen. The mineral oil also defined the beautiful grain in this block even more which I really loved. I selected the mahogany wood style with a maple stripe down the center and I had it cut in the classic shape. I chose to have our last name engraved on the front and a simple message engraved on the back. It arrived in about two weeks in a well packed box. The cutting board is well weighted so it won’t move around while you are using it. It has a fine smooth finish and deep side wells perfect for catching drips. I prefer to use my wood cutting board for breads so the wells come in handy for brushing the crumbs. You can read my cutting board cleaning methods HERE. A high quality cutting board like the cutting boards created by talented artisans in Oregon are a worthwhile investment for cooks everywhere. I believe this cutting board will last me a very long time. I give Black Canyon Cutting Boards my very highest rating and recommendation. I have never owned a convection oven, so when the fine people at Frigidaire requested a review of their Frigidaire Professional® Convection Toaster Oven I was intrigued. Part of the review request included my creation of a recipe to be made specifically for the toaster oven. You can find my recipe HERE. The toaster oven is a lot smaller than I expected, so it takes up little valuable counter space. But, it is large enough inside to toast 6 pieces of toast (see my notes below regarding the toast). You can fit a frozen pizza in there too. It is an attractive stainless steel appliance so it will fit in well with most other appliances in your kitchen. It has a very easy to follow user guide and has features that are also very appealing. The rapid cooking infrared technology offers quicker preheating and cooking and the convection function provides even cooking in less time. The power plus preheat function heats very quickly, so no waiting around for the oven to reach the proper temperature. It has a an easy to read Pro-Select® LCD Display, eight preset cooking options like, Bake, Broil, Toast, Reheat etc. you just move the, The interior of the oven is easy to clean and it even has a crumb tray to catch toast bits, etc. All in all I found the Frigidaire Professional® Convection Toaster Oven to be a useful appliance and it will continue to be used for a variety of things over the years. Christmas breakfast for 9 will be a lot easier too. Regarding the toast, this was the only function I didn’t care for. It is a “toaster oven”. If you like your toast light or even medium it works fine. But for those who prefer their toast to be a bit darker you must watch the toast very closely. The time allotted for the toast exceeds the time needed and you will end up with burned toast. Not much of a complaint really. Because, I think you should keep an eye on anything you have cooking. One other thing worth mentioning, the toaster oven surface gets hot, do not leave anything on the top of the oven (or leaning against it) while you are cooking. I do not use half stars in my rating system so I will give the Frigidaire Professional® Convection Toaster Oven Review a four star rating. A cutting board is an essential tool in the kitchen. I have a few. I use different boards for different things and I always cut my meats, fish and poultry on their own boards. A recent request for a cutting board review gave me the opportunity to use a wood cutting board again. I don’t use them much anymore. I like to put my boards in the dishwasher to sanitize them. You can find a variety of shapes and sizes available at Cutting Board USA. I love their cow shaped cutting board! I received the 9 x 12 inch rectangular maple cutting board for the purpose of this review. It is perfect for cutting fruits and vegetables. It has a nice size drip edge to catch the juices too. It’s made of a lovely piece of wood and would be a valuable tool in any kitchen. When you receive your cutting board it comes with an index card explaining the proper way to season and maintain your cutting board. It’s important you oil your new cutting board. I prefer to use food grade mineral oil to season the board. This is a fine product proudly made in the USA. Each pretty floral cup is clearly marked with the measuring cup size. Each cups measures accurately and looks so pretty on the counter while I’m cooking. This is the perfect gift to give the cook in your life and is also a wonderful prop for food photographers too. 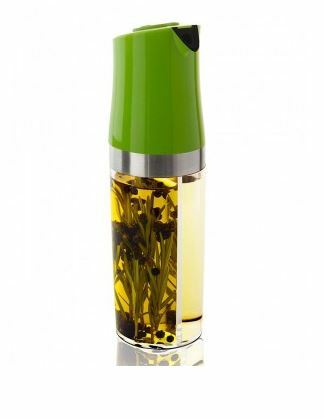 I always use vinegar and oil on my salads and I used to have two bottles or two dispensers on the table. I think this product is brilliant! Did I say brilliant? Well I meant it. You get the best of both in one container. It’s attractive, easy to fill and easy to use. Just press the button marked oil or vinegar and taa daa. This may be one of the easiest reviews I’ve ever written. It is so practical. Only drawback to this beauty is it is difficult to clean the inside the top and spout. I was happy to review this product I knew it would be perfect for parties, barbecues and get togethers. I was right.Place your serving dishes on it and it is perfect for barbecues, family gatherings, and parties. It’s made of sturdy construction and has attractive scrolled feet. It is big , it stands 22 1/ inches high and 11 1/2 inches wide. It is big enough for large platters and dishes.It will hold a 17 inch dish, a 12 inch dish and a 8 1/2 inch dish ( also available at Instawares). I liked this product so much I gave one away in the July Summer Time Giveaway. Instawares carries a variety of products perfect for tablescaping, parties, receptions, large and small gatherings. I would have given this product five stars but you do have to buy the dishes separately. These are just what I’ve been needing and they sure are a welcome replacement for the old oven mitt I’ve been using on the handles of my stainless steel pots and pans. The rubber grips help to keep the handle cover in place. The set of 2 Kitchen Grips handle covers includes 1 small(6 inches) and 1 large (7 inches) cover. Made by Duncan Industries ( Dishwasher Safe) The only thing that kept this product from receiving five stars is it does not hold it’s shape, you have to manipulate it a bit to use it. It’s worth the trouble though. * Never leave this product on the handle while you are cooking, especially if you are using an open flame. This collection is well used in our kitchen. Made of heavy gauge stainless steel construction this set comes with a 1 quart and 3 quart saucepan, an 8 quart stock pot, a 10 inch omelet ( frying) pan, an 11 inch sauté ( frying) pan and the best of all a 12 inch chefs pan ( deep frying pan). I use every piece of this collection regularly. It cooks evenly and there are even holes in the handles if you want to hang them from your chef’s rack. All of these must have items come with glass lids. In addition to the must have items you also receive 2 small bowls, a whisk, serving fork, spoon, slotted spoon, spatula and a slotted spatula. You can use this forever as it comes with a lifetime guarantee. Use them on your stove top or in your oven up to 400 ° F. Now, with all of this praise you would think I would give this cookware a five star rating. But, the handles do get hot! I have to use grips (see my other review), this is a minimal inconvenience though. Also, I did have a glass lid incident. Fortunately the lids were all replaced with stainless steel lids by the manufacturer. This set would be perfect if they’d change the lids from glass to stainless steel and cover the handles. This is an essential tool for any coffee drinker. My husband likes his coffee beans ground fresh for each pot. This little grinder did a fine job. It’s light weight and has a retractable cord. So I can keep it right on the shelf with the coffee. No need to have it out on the counter. It has three grind settings and a simple on off switch. The only thing I would change is the way the lid fits. I think it would be less messy if the top fit more securely on the inside rather than on the outside. Grounds can get in and when you take the lid off some grounds will fall out. But, this is a minor thing really. Some of the parts are dishwasher safe. But I prefer to hand wash.